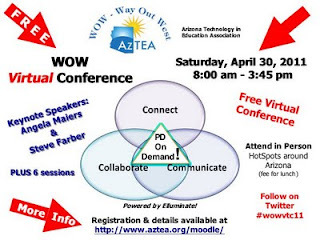 The normal Classroom 2.0 LIVE show isn't being held this Saturday, April 30th, 2011 because of the Way Out West (WOW) Virtual Conference being streamed live from 8am - 4pm Pacific Daylight Time (thanks Blackboard Collaborate / Elluminate). To attend the sessions you need to register, but the conference is free (make sure you follow both registration steps to get into the Moodle! ): http://www.aztea.org/moodle. 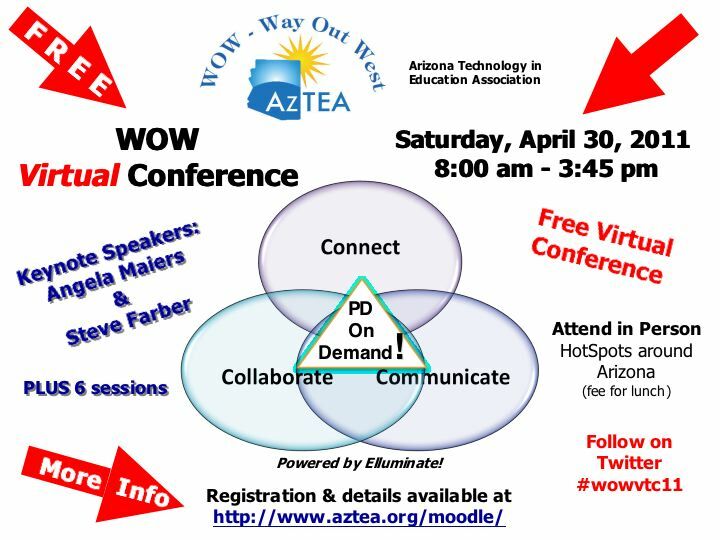 More information on the panel, and a direct link to the Elluminate session if you choose not to register for the rest of the conference, is available on Angela's blog at http://www.angelamaiers.com/2011/04/conference-hosted-by-the-arizona-technology-in-education-association.html.